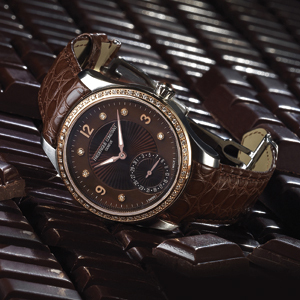 Give in to the new Maxime Manufacture Automatic Lady Chocolate! 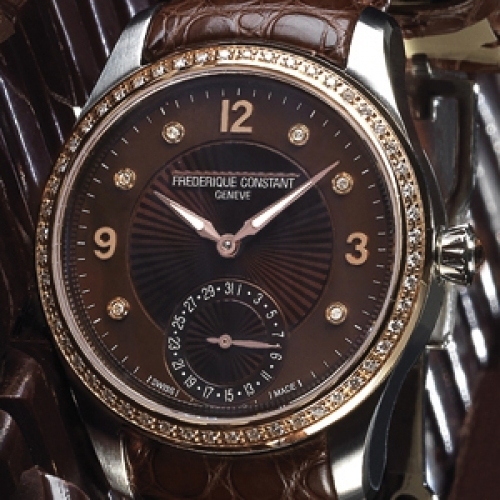 Who can resist the indulgence of chocolate, whose deep brown swathes the latest timepiece from Frédérique Constant, from the alligator strap to the mother-of-pearl dial. Driven by the brand's own FC-700 calibre, its 39 mm case is a harmonious blend of polished and brushed finishes. The 18K pink gold bezel, set with 52 diamonds, and the six diamond hourmarkers lend starry sparkle to this horological temptation. The curves of the sunburst guilloché decoration in the centre of the dial and of the date at 6 o'clock beautifully continue the rounded case. A watch that will satisfy women's expectations and more.